The Heritage Cotton Canvas Messenger Bag. 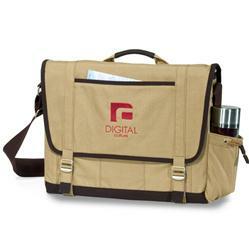 Large main compartment with felt-lined laptop pocket. Front zippered accessory pocket. Multi-function organizer under front flap. Expandable water bottle pocket. Felt-lined, easy access zippered tablet pocket on back. Wide, adjustable shoulder strap. Fits up to a 15" laptop. FREE 1-DAY RUSH PRODUCTION AVAILABLE! Production Times Available: FREE 1-DAY RUSH AVAILABLE! Standard 7 to 10-day production time with a paper proof. Embroider Front pocket center 4" dia. 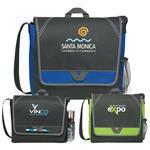 Available Imprint Options: Color Print or Embroidery or Full Color. Inquire for other methods. 12 oz Cotton Canvas, Computer Messenger Bag, Tablet Holder.